One of my favorite things to do is reading to my baby. There’s no shortage of books in his bedroom but we still have our favorites that early on became part of our nightly routine. I make sure to read to him every night, and will even do it over the phone if he goes to bed before I get home from work. There are a ton of benefits for your baby if you start reading to them at a young age, so make sure you don’t forget to add them to your registry. Don’t forget to include some of your favorites from your childhood. How soon should you start reading to your baby? The answer is simple, it’s never too early. I started reading to my son as soon as we came home from the hospital. Of course, as your baby gets older they will be able to pay more attention and interact more with the books. Reading to your baby has a ton of developmental benefits. Even as a newborn, reading to your baby will lay the foundation for their communication skills. They will learn to listen to your voice and the fluctuation in your tone. This will all help them to become better at reading on their own as they get older. They will also develop their vocabulary through books. They will learn topics basic like numbers, letters, and colors. Animals, shapes, and sounds are also learned as you read. Keep in mind that, especially if your baby is still very young, they will gain these skills no matter what you read to them. If you have a book that you are currently reading for yourself, include your baby during your reading time or if you are a student read your textbook aloud with them. In addition to the developmental benefits, there are other benefits to reading to your child. My favorite part of reading to my son is the bonding time that we get. I read to him every night as part of his bedtime routine (right after his bottle) and he just snuggles in, sometimes falling asleep halfway through. It also helps create that evening routine. The more consistent you are with a routine from the beginning, the easier bedtime will be as your baby gets older. Your baby will view reading as a fun activity with you and as they get older they will have an easier time reading on their own. They are also more likely to enjoy reading. 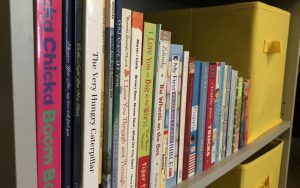 When it comes to picking the best books to read with your baby there are a few things to consider. Size – The size of the book is an important thing. If you will be reading the book, you can pick some that are a bit larger. If your baby will be holding the book at some point or if you plan on reading the book while you hold your baby you will want something smaller and more manageable. Text – Look for books that have less text per page. They will be easier for you to read to your baby and your baby will be have an easier time taking over as they get older. Images – Books with lots of pictures will keep your baby’s attention. When they are very young look for books with a lot of contrast because they wont be able to see colors until they are around 5 months old. Topic – You can get books on just about any topic, so your best bet is to have some variety. This will allow your baby to learn different things from each book and will help keep things from getting too repetitive for you too. Sensory elements – Many books have added elements. I’ll talk about these more below, but finding books like these can help your baby with additional sensory development. Author – Does your baby giggle when you read Dr. Seuss or do you find Lisa Bergren’s God Gave Us series particular touching? If you or your baby finds an author you like, buy more of their books. There are books for all types of occasions and different types of books will offer different developmental opportunities for your baby. Some books can be used by your baby without your help, and others are designed for you to read to them. You can find small books that have very few if any words and can easily be handled by your baby on their own. Some of them are small, soft books that make a crinkle sound when held. They can handle being chewed on and thrown across the room. These have always been one of my son’s favorite toys. 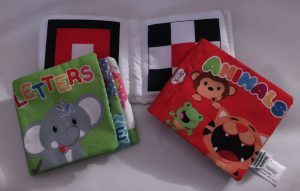 Small board books are also a great option for your baby to be able to start handling on their own as they get bigger. These don’t handle slobber quite as well, but they are still durable enough to withstand the beating they will take. Remember those sensory elements I mentioned earlier? Well here they are. 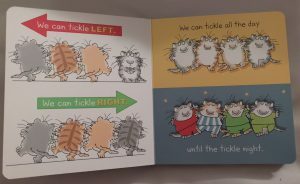 Touch and feel books are a great option that will help your baby learn about different textures. I like them because they allow your baby to be an active participant in story time. Another fun option is books that have finger puppets. Finger puppets are great for keeping your baby engaged in the story. My son loves to watch the puppet move as I read to him. Lastly pop up books will teach your baby about movement. My personal favorite is The Wheels on the Bus because it has a different type of movement on each page. When it comes to teaching your baby the basics, look for concept books that focus on things like ABCs, numbers, shapes, or colors. 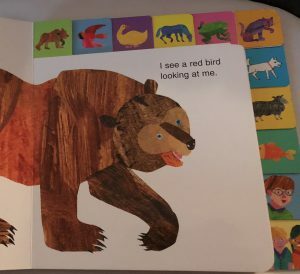 You can even find books that incorporate multiple concepts like many of Eric Carle’s books. 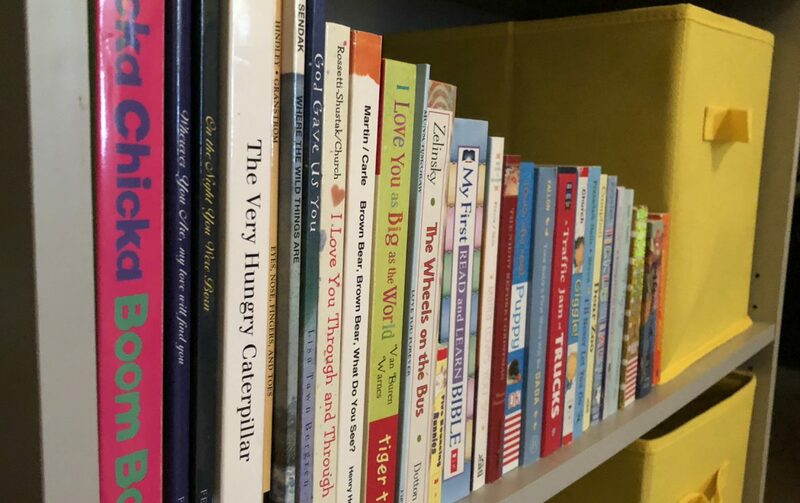 These books will become more and more important as your baby grows because they will most likely be some of the first books they start to help you read. Much like concept books, activity books will be great for teaching your baby. You can find books on pretty much any topic. Things like eating, napping, and playing can be taught in fun ways with the help of picture filled books. They can also be helpful for you when it comes to strategies for things like potty training. Some books are design with the specific intention of helping your baby get ready for sleep. Since reading is part of our bedtime routine, I make sure to have plenty of these books handy. These books can continue to be part of a good bedtime routine for many years. The time that you take to read with your baby will help them grow and develop, but it will also make lasting memories. It will also grow your bond with them. Cherish the opportunities you have to read with your baby because there will come a day when they don’t want you to read to them anymore. Share your favorite baby books and memories below and read more about creating a bedtime routine here. It has been proven that a baby can respond to what is said to him or her at a very early age. having something read from a book would be quite stimulating to them, coming from the mother or father’s voice. Definitely. 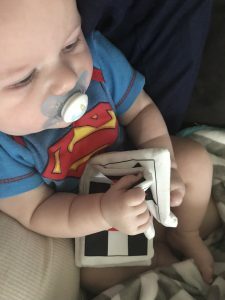 At only a few months old my son really started paying more attention to the books.